Ranking high up the table was expected for the agency after its stellar performance at the 2014 awards ceremonies last month. It won no less than 10 Loeries: six for Coca-Cola South Africa (for whom it took one of just four Grand Prix awards made over the weekend for its inspirational #RainbowNation activation during Freedom Month), two for Toyota Genuine Parts, and one each for Lexus and Labello. 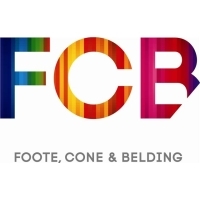 On a personal level, FCB Joburg Executive Creative Director, Jonathan Deeb is at the top of the Executive Creative Director table while FCB South Africa Group CEO and Chief Creative Officer, Brett Morris, takes 2nd place on the Chief Creative Officer list. Demonstrating the agency’s creative depth and strategic prowess, three Creative Directors and a Senior Strategist were also ranked highly on their respective tables. “Putting in such a strong performance on the Loeries Official Rankings tables is the proverbial cherry. High 5 to both agency and client teams for their ground-breaking work; and personal congratulations to Sharon, Brett and Jonathan, as well as Collette, Grant, Tian and Kabelo,” said Mokoena.